Places a barrier to stop moisture loss and to protect lips from the harsh effects of cold weather and wind, which cause your lips to crack and become chafed. For those who work and run outdoors use ChapStick to prevent drying around your nose and on the skin of your face in cold weather. 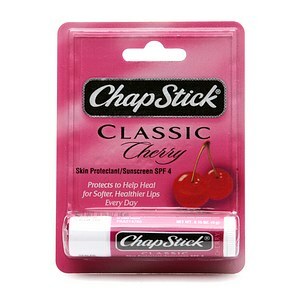 Chapstick Cherry Lip Products in Bulk Quantities. Softens and protects for smooth, silky lips every day. Helps heal and prevent dry, chapped lips. Has a sweet cherry flavor.